All three of my regular blog readers will know that I am on a life-long quest for the best recipes. Some of the recipes I’m looking for include: banana bread, chocolate chip cookies, peanut butter cookies, waffles and brownies. Hmmm… those are all sweet items. What does that say about me? I’ve successfully knocked a few off of my list, but it’s safe to say I’ve tried hundreds of different recipes in my pursuit for perfection (still on the lookout for the ultimate peanut butter cookie, if you have one, send it my way). I love brownies. And I am a brownie purist. I do not like them with frosting. I do not like them with smarties. I do not like them with cream cheese. 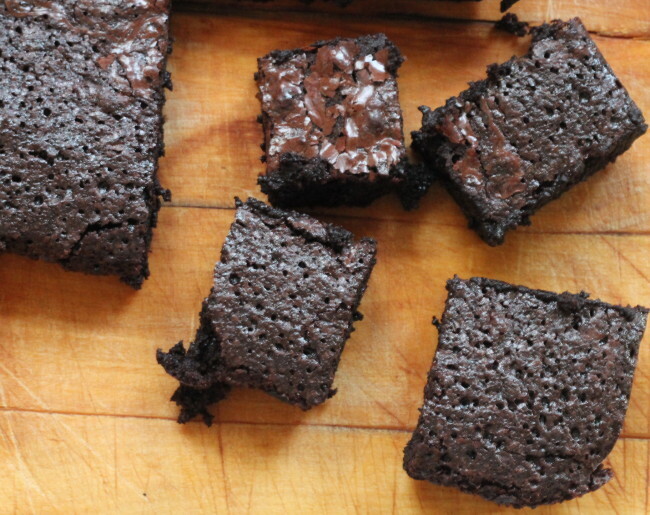 I like a simple, fudgy, warm, moist brownie (maybe with a scoop of ice cream on top). For a really long time, when the brownie craving hit, I would head to the store for a box mix. There are very few, if any things that come out of my kitchen that start with a box mix, so you understand how this was bugging me. But I just couldn’t find a recipe I liked better than the boxed mix. I was thumbing through a magazine, looking for ideas to make for a friend’s birthday, and came across this recipe by Rachael Ray. I’m not her biggest fan (she cooks A LOT with meat), but I do own some of her cookbooks, and I like her easy-breezy attitude in the kitchen. The other thing I liked about this recipe is that it doesn’t require melting chocolate. I melt chocolate lots, but I prefer a brownie recipe that uses dark cocoa as its base, because I know I always have it in the house. Additionally, this recipe minimizes the amount of bowls and things you need to use to make it. Less stuff to have to wash = winning in my books. 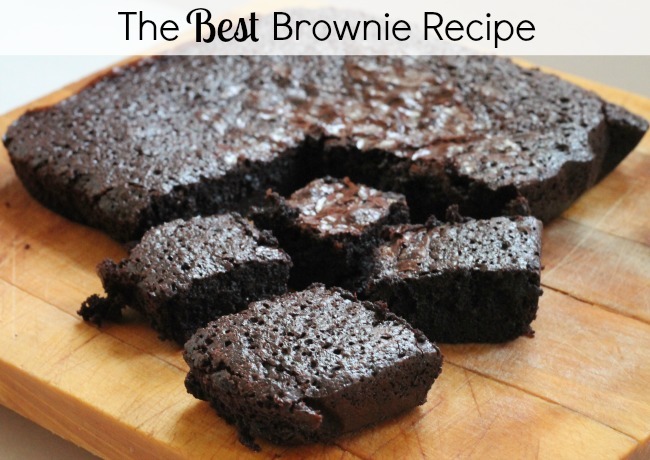 The original magazine article featured a ton of different ways to dress this base brownie recipe up. You can do that if you like. I’ll just be over here savouring my plain one. In a large saucepan, melt the butter. Add the sugar, and whisk it in well, until it’s all incorporated. Add the vanilla and salt, and stir until smooth. Remove from the heat and allow to cool a little. In the meantime, whisk together the eggs in a separate bowl. Slowly add the eggs to the butter/sugar mixture, whisking all the time, so the eggs don’t cook. You can temper the eggs with a little of the warm butter first, if you like. Sift the cocoa and add it in, mixing well. Finally, add the flour and mix until incorporated. Bake in a 350 degree oven for about 20-30 minutes, or until a pick inserted in the middle comes out with crumbs clinging. Allow to cool for at least 30 minutes.